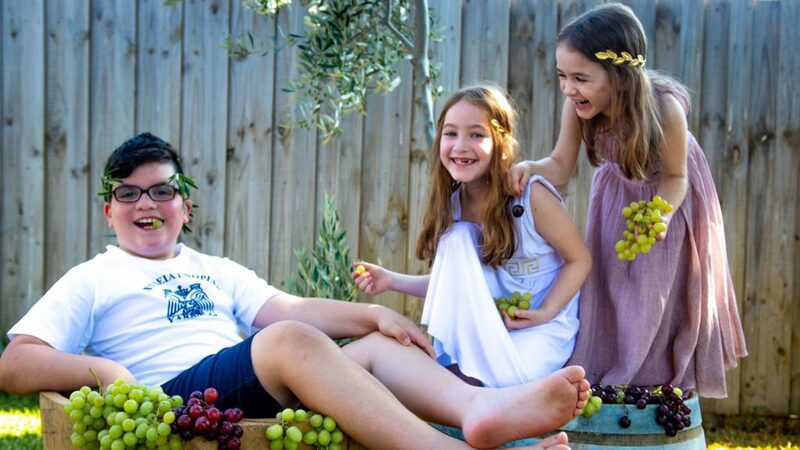 Children from St Nicholas Greek school Yarraville are putting their best feet forward in the first-ever grape squashing competition, in preparation for the upcoming Yarraville festival in February this year. The event to be held on Sunday 17 February 2019 will involve school kids squashing grapes with their bare feet – just like their forefathers used to do in Greece hundreds of years ago! The competition aims to teach kids the traditions of making ‘mousto’ or grape juice the old-fashioned way, and hopes to inject some fun and excitement into the day. Spokesperson and Principal for the school, Father Alexandros said the activity is not for the faint-hearted, as organisers are looking for participants who don’t mind getting a little bit sticky. “Roll up your trousers because bare feet are all you need to get involved. Who will be crowned Yarraville’s best grape squasher? There are prizes to be won for the best grape squashing technique and the fastest grape squasher,” he said. Following the success of our recent Zorbathon dance off in November last year, the school will again host the ever-popular Zorbathon dance competition to find Melbourne’s best dancer. “Children and adults are both welcome to join in on the competition,” said Father Alexandros. Other entertainment on the day will include traditional Greek dancing on the main Community stage at 1pm sharp.We will also be selling delicious traditional Greek doughnuts called loukoumades, which are very popular, as well as fairy floss and host a sausage sizzle too. All money raised from the day will go directly back towards the school – investing in new technology to help educate the next generation of Greek Australians living in Melbourne’s west. St Nicholas Greek School was one of the very first Greek schools in Melbourne and continues to play a central role where many Greek Australians gather to embrace their cultural identity. Many religious celebrations are held at the church including Christmas, Easter, baptisms, weddings and other cultural celebrations. The school currently has 140 students enrolled from prep all the way to VCE. The school has been formally recognised by the Victorian department of education for the past 21 years, with all learning programs fully accredited, reflecting the Victorian Curriculum for Greek language. St Nicholas Greek school is at 5-9 Murray Street, Yarraville.